Say hi to the new Balmain army… a virtual one at that. 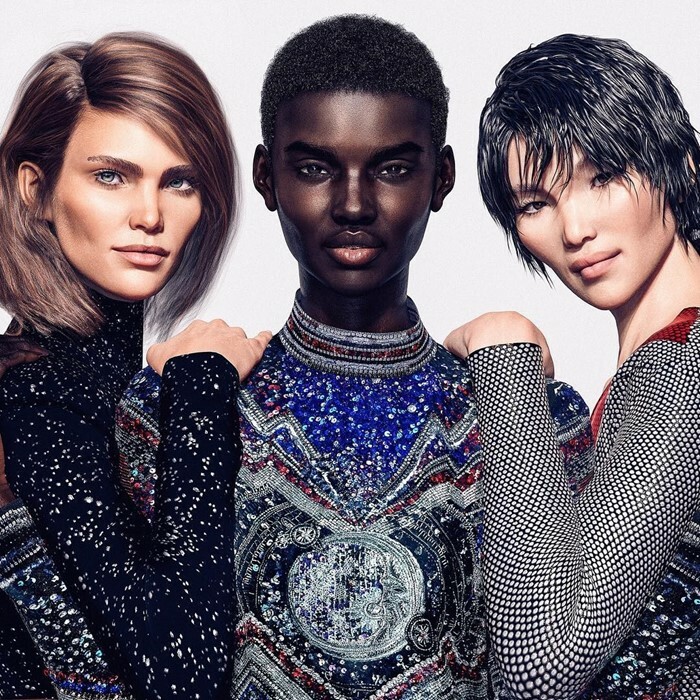 For its Pre-Fall 2018 campaign, Balmain has enlisted three digitally-created models to wear a virtual version of the collection. There is Shudo, the world’s first digital model, and its creator made two more friends to join her —Margot and Zhi. What would this mean for the future of fashion? Will digitally created models replace existing fashion influencers? We are reminded of the 2009 film Surrogates starring Bruce Willis, where people could purchase perfect, fit looking robots in replace of their own bodies and operate them from afar, allowing everyone to live in idealized forms from the safety of their homes. You could already imagine it wouldn’t be all too hard to create images of perfectly tanned bodies casually sitting next to a table of tapas at a beach club. Just plug in clothes, shoes and sunglasses from whichever brand that needs eyeballs on their latest collection and you’ve got an #ootd post! Already, this doesn’t seem all too far fetch. “Deepfakes” are spreading through online communities, and people are having a hard time telling the difference between what’s real and what’s not. If you need a refresher, deepfakes are videos that use machine learning to superimpose famous people’s faces onto other people’s bodies to make it look like they’re doing or saying things that they wouldn’t normally do or say. Soon it won’t be too hard to get Kendall Jenner to endorse your freshly launched aluminum free deodorant brand without paying half a million for a post. However, celebrities are influential specifically because they have lives, opinions and professions outside of their Instagram profiles. The Kardashians are famous because of their reality show, Christian Ronaldo — because of his football, Selena Gomez –because of her singing. Perhaps, those who are most vulnerable to the invasion of virtual models are those who are simply relying on their looks and the occasional witty caption for rent. If a computer could do what makes you special, then it’s time to diversify — and do it before the algorithms catch up.